The warm, humid climate here in Tyler, TX and the surrounding area creates the perfect environment for dirt, algae, and mildew to form on the surface around your home. In most cases, it is a great idea to let a professional pressure washing company perform the exterior cleaning of your home and exterior surfaces. But when searching around it is obvious that there is no shortage of companies that offer pressure washing service. So how can a homeowner in Tyler TX select a reliable pressure washing company? What are some questions that you should ask and how do you know that you have identified a reliable pressure washing service? Let's face it, appearances matter. A reliable, well-established pressure washing company will appreciate that you have invited them to your home and will have taken steps to make sure that you are comfortable with your decision. 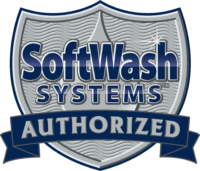 This can include vehicles that are in good repair and properly branded as well as employees that are background checked so that you can feel secure knowing that the individuals performing your pressure washing service are experienced professionals. Did you know that you should never wash the siding or exterior surface of your home with the same amount of pressure that you wash your driveway or roof with? If the pressure washing company that you are considering does not know that either then you should consider someone else. Whoever you choose, your professional pressure washer should be able to demonstrate, thru their website and in talking with them, that they are experts in pressure washing…your home deserves nothing less. Never be shy about seeking out what others in your area say about the service and professionalism of a pressure washing company. Seeing how the employees of a pressure washing service treat the property of others can be a good indicator of the type of service that you can expect both before and after the service is performed. Sites such as Google and Facebook can be invaluable in this regard. There is a reason that so many homeowners in the Tyler, TX area have been turning to the pressure washing experts at Poseidon Power Washing for all of their exterior cleaning needs. Our friendly technicians undergo rigorous training and background checks and perform all of our services using state of the art equipment and industry-leading techniques. Ready to schedule service today? Click below to fill out our request form online, or call us at 903-284-8751.